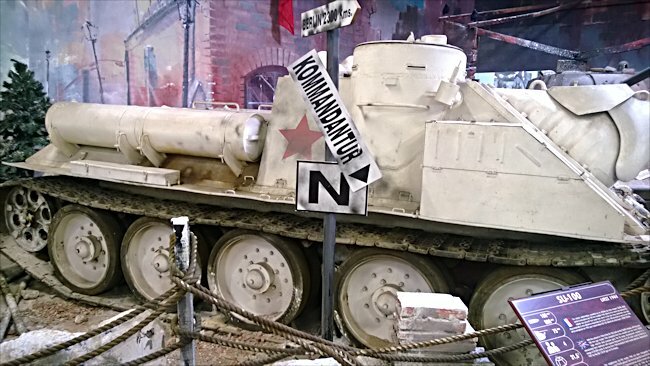 This SU-100 Russian Soviet Tank Destroyer SPG can be found at the French Tank Museum in Saumur in the Loire Valley. The Museum is called Musée des Blindés ou Association des Amis du Musée des Blindés, 1043, route de Fontevraud, 49400 Saumur, France www.museedesblindes.fr . The word Blindés means armoured. 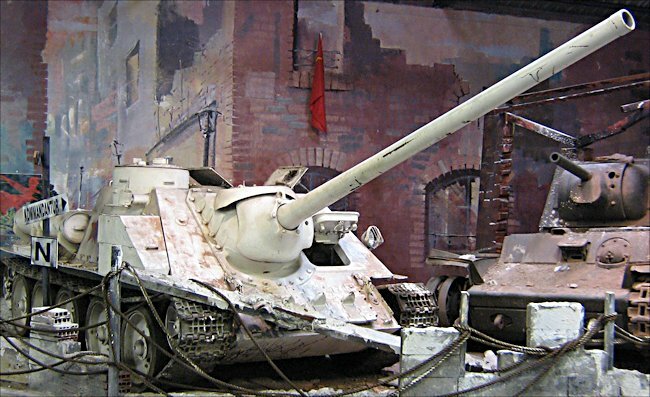 By the end of 1943 Russian army realised that it's SU-85 tank destroyer wasn't up to the job. The German enemy opposition had increased the armour thickness on the tanks it was deploying to the battlefield on the Eastern front. The Russian engineers decided it was time to up gun their standard tank destroyer. They manage to fit a 100 mm gun into the same T34 tank body. It became the SU-100 tank destroyer. 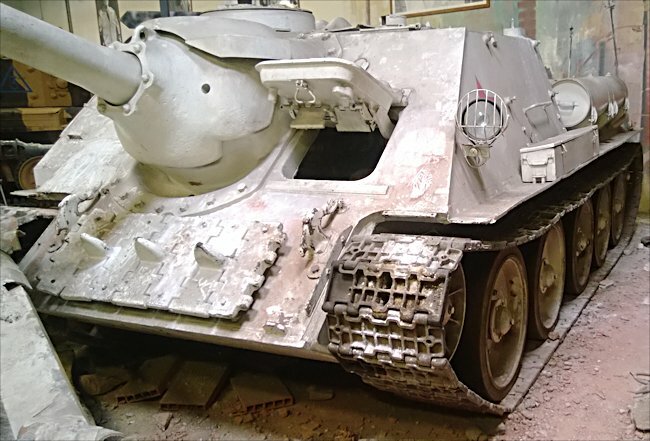 The Russians managed to manufacture a prototype of this vehicle in February of 1944. Russian still had a number of 85 mm guns in storage so continue to produce the SU-85 tank destroyer at the same time is producing the SU-100 tank destroyer. This carried on until autumn of 1944 when production of the SU-85 stopped. Using the T34 tank chassis chassis for this anti-tank weapon was a good choice. It was robust, efficient, mechanically sound and moved well over open countryside. 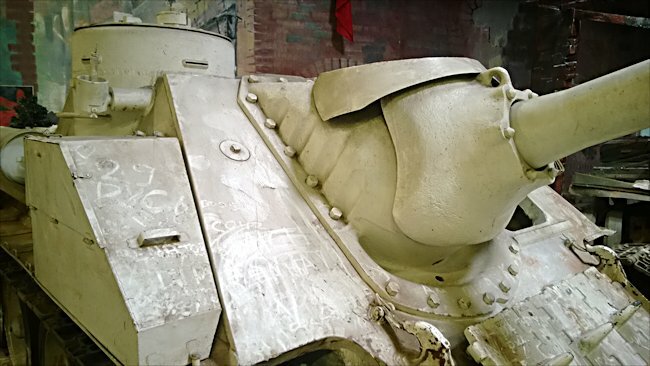 The front armour plate on the SU-100 is much thicker than that of the T34/85 medium tank. It has 70 mm of sloping armour. On late production models the front sloping armour is welded directly onto the Hull to make production easier. Early models had a third piece of armour that joint the two plates together. To increase the armour protection even more spare track links were bolted to the front of the vehicle's sloping armour in between the two tow hooks and the plug on either side, which was part of the track tensioning system. The track on the SU-100 tank destroyer has no sprocket wheel. The drive wheel meshes with the centre guides. The centre guides are on every other tracked link. The links are held together with pins that have no retaining system. There is a slope wedge welded to the outside of the tank by the leading edge of the track that simply wax back into place any track pins that start to wiggle out of position. This tank destroyers had four 90 liter external fuel tanks, two on each side attached in racks. If you see a SU-100 with external fuel tanks on the rear of the vehicle then this is a post-World War II, Cold War addition. The strange small cone shaped protrusions on the outside of the chassis are covers for small arms firing ports. The back of the SU-100 tank destroyer is very similar to the T34. It has 45 mm of sloped armour. It can all be unbolted to enable access to the engine. There is a small red navigation light at the top. The two thin tubes coming down and then going left and right from the top of the armour plate are for deploying smoke. The Russian gunner only had manual controls the was no electrical power on this tank destroyer. To traverse the D-10S 100mm gun he has a screw system and for elevation it is a toothed arc. It was a maximum anti-tank weapon and saw service on the Russian T-54 and T55 Cold War tanks as well as a towed anti-tank gun. The gun was very long. It had an overhang of 3m you have to be very careful when driving this tank destroyer, so as not accidentally hit something with the gun. The clever little invention inside the Casement by the gunner was a travel lock. It was an armoured could be swung down from the roof and bolted to the back of the gun when moving to a new position. This reduced stress and swing on the gun mount. The SU-100 tank destroyer was a good vehicle. It had a low profile, thick sloping armour at the front and a very good tank busting gun. By the end of the war, around 1600 had been produced. 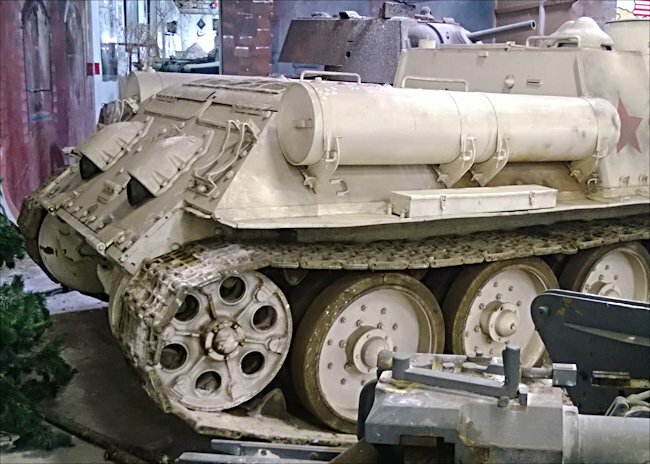 Where can I find other preserved SU-100 Tank Destroyer?